A significant contributing factor to the Union success at Vicksburg was the skill of the North's naval commanders. One of the most colorful naval commanders of the Civil War was David Glasgow Farragut. Though he was unsuccessful in early naval operations against Vicksburg, Farragut's success at New Orleans and Mobile Bay secured his place in history as one of America's most celebrated heroes. The man who would become the first Admiral of the United States Navy was born James Glasgow Farragut near Knoxville, Tennessee on July 6, 1801. His father, Jorge Farragut, hailed from a seafaring family and emigrated to this country in 1776 from the island of Minorca, off the east coast of Spain. Before his death in 1817, Jorge Farragut would serve his country gallantly in the revolutionary War and the War of 1812. Young James would soon follow in his father's footsteps. 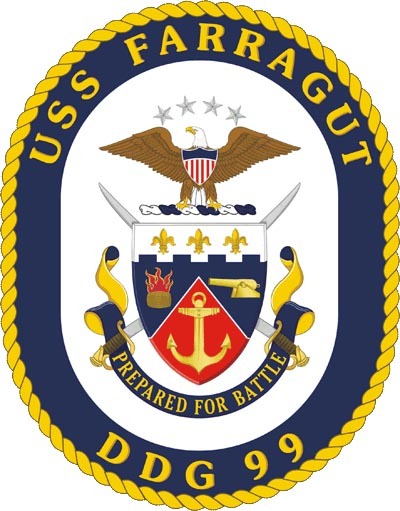 David Porter, one of the Navy's finest officers, befriended the Farragut family through an unusual chain of events in which the Farraguts rescued Porter's unconscious father from the deck of a drifting boat. When the elder Porter passes away, David was grateful to the family for taking care of his father and offered to take young James and train him as a naval officer. At the time it was not uncommon for parents to place a child with someone who could train them in a career. Hence, James Glasgow Farragut came under the guardianship of David Porter and changed his name to David G. Farragut. David followed his adopted father to the sea at the tender age of eight and received his first naval appointment as midshipman at large at the age of nine and a half. At age eleven he saw his first combat and even commanded a vessel at age twelve! The young sailor had seen a lot during his four years at sea, but his greatest achievement was yet to come. "I am to have a Flag in the Gulf, and the rest depends on me." Fifty years later at the outbreak of the Civil War, David Farragut had a difficult decision to make. He was born in Tennessee, raised in Louisiana, and lived in Virginia, yet he felt more devoted to the country he had served for more than five decades. He decided to join the Union and moved his family north. In January 1862, Farragut was named Flag Officer in command of the West Gulf Blockading Squadron with instructions to enter the Mississippi and capture New Orleans. He was placed in command of eighteen wooden vessels including his flagship HARTFORD, a fleet of mortar boats, and 700 men. To the objection of his stepbrother David Dixon Porter, who was in charge of the mortar boat flotilla, Flag Officer Farragut made the decision to run past Forts Jackson and St. Philip to take the city of New Orleans. To prepare the ships to run past the forts, the crews crisscrossed the hulls with great chains until they were almost as well protected as the ironclads. Further, since he planned to pass the forts at night, Farragut had the hulls covered with mud from the Mississippi to make them less visible from the shore and had the decks painted white so that needed objects would stand out clearly. He even had tall trees lashed to the masts of his vessels so that the enemy would think they were trees on the opposite bank! Farragut's strategy worked. The commander described the intense passage: "The smoke was so dense that it was only now and then we could see anything but the flash of the cannon ... The passing of Forts Jackson and St. Philip was one of the most awful sights I ever saw." His own vessel, the HARTFORD, was disabled when a raft set afire rammed the flagship and flames damaged the masts and rigging. Nevertheless, the fleet safely reached New Orleans and took possession of the city on April 28, 1862. "I mean to be whipped or to whip my enemy, and not be scared to death"
In May of 1862, Farragut attempted to subdue the city of Vicksburg, located about 400 river miles above New Orleans but his bombardment was unsuccessful. He did not have enough guns in his fleet to overwhelm the city. Plus, Vicksburg's 200-foot river bluffs were so high that many of his guns could not get sufficient elevation to hit the Confederate defenses. Fearing the receding waters of the Mississippi might strand his oceangoing warships in the summer months, Farragut reluctantly decided to withdraw from the river city. He left six gunboats below Vicksburg and returned to New Orleans. Upon his return to the Crescent City, Farragut began organizing a second, stronger expedition against the "Gibraltar of the West." His fleet arrived below the Vicksburg bluffs once again on June 25, 1862 and began preparations for a second bombardment. Farragut then received news that Charles H. Davis, commander of the Western Flotilla, had finally captured Fort Pillow and Memphis and was now only 20 miles north of Vicksburg. Consequently, Farragut decided to run his fleet north past Vicksburg, just as he had done at Forts Jackson and St. Philip, and rendezvous with Davis. At the appointed hour of 0200 on June 28, 1862, Farragut raised two red lanterns on the mast of the HARTFORD as a signal for the fleet to proceed. The ships were spotted at 0400 and Vicksburg's 29 heavy guns were answered by the guns of Farragut's fleet. All of Farragut's ships but three made it through and none were sunk; however, some were badly hit, including the HARTFORD. The captain's cabin was blown apart by a shell just seconds after Farragut had moved to another part of the ship! Although running the batteries was a gallant act, Farrgut's juncture with Davis did little to bring about the subjugation of Vicksburg. It was clear a combined naval and land attack would be necessary to subdue the "Gibralter of the West." Before Farragut withdrew his fleet from Vicksburg a second time, he had an encounter with the Confederate ironclad ARKANSAS. Launched at Yazoo City and commanded by Isaac Brown, the ARKANSAS bravely plunged into the midst of the thirty-eight Union warships anchored above Vicksburg in mid-July 1862. Brown's attack was aided by an element of surprise, and the fact there were so many Union ships they had very little room in which to maneuver. As a result, Farragut's warships were only able to bring a few guns to bear at a time against the formidable ironclad. During the fighting, the ARKANSAS caused serious damage to the HARTFORD and Farragut was furious that a makeshift enemy ironclad had steamed right through his fleet. He had enough of the pesky ironclad. Fearing once again his vessels would be stranded due to dropping river levels, Farragut decided to withdraw from Vicksburg and sailed south. The withdrawal of the Union fleet from Vicksburg in July of 1862 closed the first phase of Union naval operations against the city. "Damn the torpedoes! Full speed ahead!" Two years later In 1864, Rear Admiral Farragut was summoned from his Now York home to serve his country once more in leading an attack on Mobile Bay, the last Confederate stronghold in the Gulf of Mexico. Mobile Bay was not only protected by Fort Morgan and a fleet of wooden vessels, but also by the formidable Confederate Ram TENNESSEE and a field of explosive mines called torpedoes. Undaunted, Farragut readied his fleet for battle. Using a strategy that had worked before, he ordered his wooden ships lashed together in pairs, one large and one small. In this manner, if the larger frigate was disabled in battle, the smaller vessel could tow it into safety. Farragut's fleet of wooden ships, along with four small ironclad monitors, began the attack on Mobile Bay early in the morning of August 5, 1864. When the smoke of battle became so thick that he couldn't see, Farragut climbed the rigging of the HARTFORD and lashed himself near the top of the mainsail to get a better view. It wasn't long before the TECUMSEH, one of the monitors leading the way, struck a torpedo and sank in a matter minutes. In a state of confusion, the fleet came to a halt in front of the powerful guns of Fort Morgan. Realizing the fleet was reluctant to move forward due to the "infernal machines," Rear Admiral Farragut rallied his men to victory, shouting: "Damn the torpedoes! Full speed ahead!" The Union fleet steamed ahead through the minefield, blasted Fort Morgan, and captured the Confederate ironclad TENNESSEE. Thus, Mobile Bay fell into Union hands in one of the most decisive naval victories of the Civil War. The Battle of Mobile Bay would be Farragut's last. Overcome with fatigue he returned to New York in December 1864 a national hero. In 1866, Farragut became the first person in the history of the United States Navy to be awarded the rank of Admiral. Two years later In 1868, he was even asked run for the office of President of the United States, but replied, "I hasten to assure you that I have never for one moment entertained the idea of political life." Farragut would have only two years to live. The first Admiral of the Navy died on August 14, 1870 it the age of 69. His funeral procession in New York City included 10,000 soldiers and sailors and was headed by President Ulysses S. Grant. A statue of Admiral Farragut was erected in the heart of our nation's capital known as Farragut Square. It remains a lasting tribute to the most distinguished naval officer of the Civil War. Supporters: The crossed Union Civil War officer's swords recall Admiral Farragut's perpetual readiness, devotion to duty, audacity in combat, and support the motto "PREPARED FOR BATTLE". The Shield: Dark Blue and Gold, the colors traditionally associated with the Navy, represent the sea and excellence. Red highlights Admiral Farragut's valor, loyalty, and fearless leadership while commanding the Western Gulf Blockading Squadron during the Civil War. The pile symbolizes the prow of a ship, suggesting USS Hartford, Admiral Farragut's flagship. The anchor refers to naval strength and maritime tradition. The enflamed barrel mine signifies the powder-filled kegs anchored in the approaches to Mobile Bay, whose presence prompted Admiral Farragut's famous phrase, "Damn the torpedoes; Full speed ahead!" The cannon suggests the land-based batteries that fought with naval forces as they pressed past to control maritime paths of communication and supply. The pile between the enflamed barrel mine and cannon alludes to Admiral Farragut's bold leadership of his fleet through all obstacles to enter Mobile Bay and defeat enemy naval forces therein. Earlier, Admiral Farragut opened the Battle of New Orleans by steaming up the Mississippi River past Fort Jackson and Forst St. Philip and positioning his forces near the city of New Orleans to force its surrender. The victory tightened the stranglehold on Confederate logistics and commerce. On the ship's shield, the chief embattled denotes the strong defenses of the Mississippi River; and the three fleurs-de-lis are adapted from the flag of New Orleans. 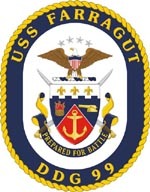 The Crest: The four stars represent the naval rank of Admiral, first authorized by Congress for Admiral Farragut in recognition of his service and achievements. David Glasgow Farragut was the first officer in the United States Navy to hold the ranks of Rear Admiral, Vice Admiral, and Admiral. 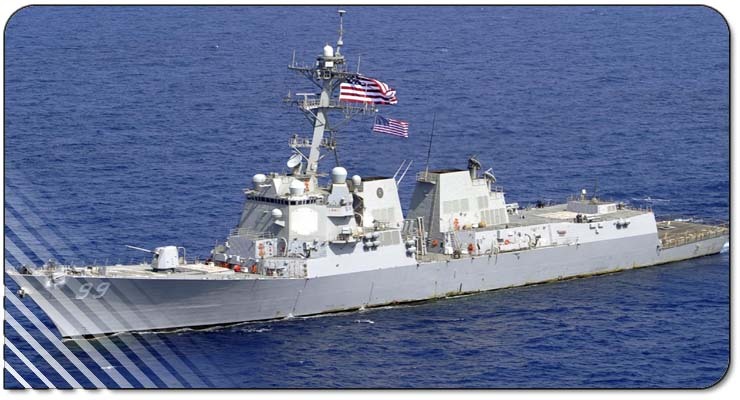 The four stars also commemorate the four previous ships named Farragut. The bald eagle with shield signifies Admiral Farragut's patriotism and loyalty to the Union during the Civil War and lifelong fidelity to the naval profession.